Santa has arrived at your house! There must be good boys and girls living here! Santa’s sack is full of presents for everyone. All your favorite Christmas images are here from mistletoe to gingerbread cookies and candy canes on this cheerful mural. 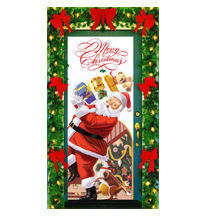 Your door will spread Holiday joy and a hearty ho-ho-ho to all!